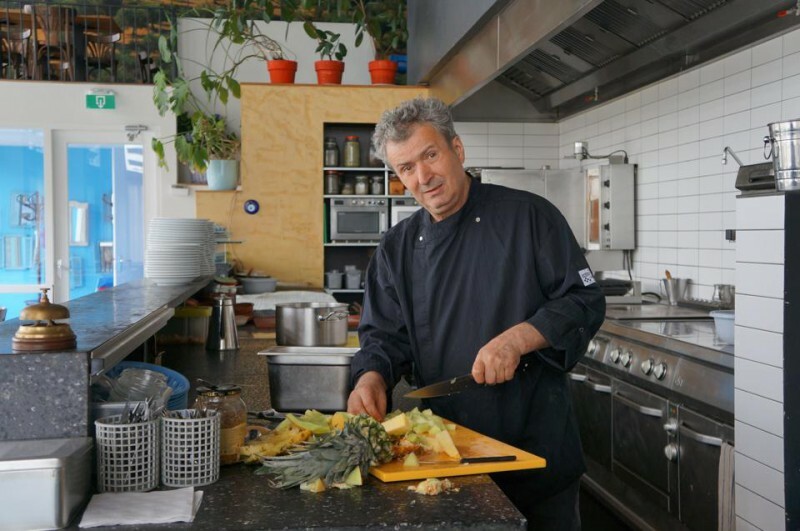 The seeds for Nikos Tsiaxiras’ culinary career were planted at birth. Growing up in Tsopela, a tiny village tucked away in the mountains of northwest Greece, his childhood was filled with laughter, love, and a table full of delicious dishes. Two activities in particular as a young boy – gathering herbs fresh from the garden and watching his mother bake bread – sparked Nikos’ interest in food. Following a short stint in construction work and two years serving in the military, Nikos entered the restaurant world and the adventure began. Without any experience, 20-year-old Nikos and two of his friends started a small restaurant in Athens. Three months in, they were forced to close. In 1977, in order to pay off his debts, he embarked on a new journey: cooking aboard cargo ships. After two years of sailing the bright blue waters and traveling the world, he settled in Amsterdam. Since then, he’s developed a reputation for serving incredible Greek fare. Between cooking in prestigious establishments and owning three restaurants – Restaurant I-Grec is his current venture – Nikos’ culinary skills, among other traits, are the key to his success.